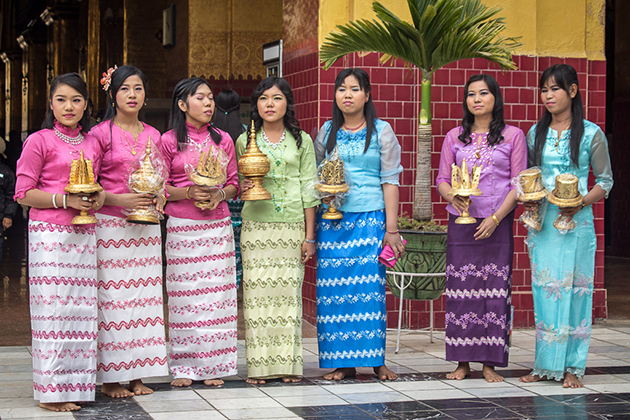 Myanmar is a country with diverse over 130 ethnic groups. All of them bear their own tradition, dialect, culture, legendary as well as traditional costume, this promise to bring you interesting Myanmar tour packages. Burmese traditional costumes are Longyi (also called Sarong) together with Eingyi (Blouse and shirt). As the King of Anawyatha took the lead in the battle in the country of India, he at the same time brought this country’s traditions as well as cultures back to Myanmar. By that way, Indian culture has had a sharp influence on Burmese people since then. During Myanmar travel and tour, travelers can notice that there are distinguished in old costumes between Shan and Kayah men in term of loose trousers. They are different from each other at color: trousers of Shan have light brown or gray color, while those of Kayah are all in black. The traditional Longyi is 2 meters long and it is made from the cloth used in an unfinished garment or the material of cotton. Nowadays, the Burmese wears Longyi for daily use, which makes the iconic of the country. Longyi is worn by both men and women. Across the Myanmar, from the countryside to the crowded modern city, locals use this kind of attire commonly. It is definitely suitable for Myanmar’s hot climate, as it allows air circulation for keeping cold. There are various styles specifically associated with various ethnic groups. For instance, Kachin is famous for diamond – shaped patterns, while Bama is famous for zigzag patterns. Also, flowers patterns are suitable for women for special occasions such as graduation or marriage ceremonies. Therefore, Longyi can be worn for all kinds of opportunities, each kind of Longyi is appropriate for a specific purpose, up to the quality and pattern of the material. 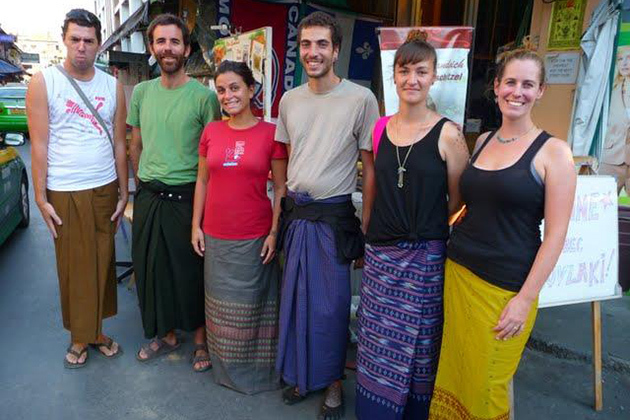 To wear and make your excursion to Burma more unforgettable, you can ask locals for helping you gather the front of this traditional attire in order to create two short lengths of the material and they will support you to twist these lengths into a half knot, tucking one end in at the waist and the other will be protruded from the knot. Or you can easily find purchased Longyi in all shops or markets. Maybe it only cost 10 USD for a common dress. Traditional Longyi is growing in popularity among foreign visitors, who often like buy them as a must – have souvenir when coming to Myanmar, or even for wearing themselves while they are in Burma.